Fast & Furious 2-player simultaneous action!! 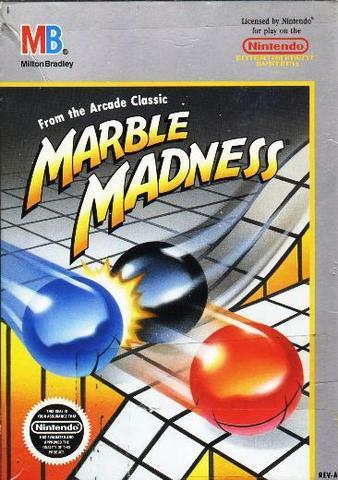 Marble Madness is a typical marble-rolling simulation game. 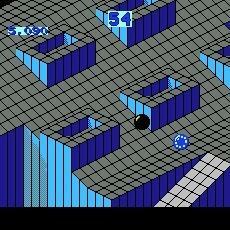 Originally released for the Atari in 1986, Marble Madness has rolled its way onto multiple platforms, including PC, Genesis, Game Gear, Game Boy, and Game Boy Color. The game has also spawned countless imitations. A modern example is the game Super Monkey Ball (Gamecube) which clearly draws from Marble Madness in its devious level design. Though the sinister black (evil) marble and the jumping worms aren't there, specially designed machinery still shows its place in many imitations of this classic game. Controls are simple, yet if overlooked, can make for a very difficult marble-rolling experience. Stick with the old NES adage: "If it's not that button, it's the other one." In the case of Marble Madness, two control types are offered. The 90 degree mode is a traditional controller configuration where the controller is held at a 90 degree angle. However, a concept never before seen enters the arena in Marble Madness' revolutionary 45 degree mode. In this groundbreaking mode, the controller is held at an unheard of 45 degrees! This innovation truly paved the way for the systems of today, including the motion-sensitive Nintendo Wii. In both modes of play, a secret Marble Boost can be activated by pressing (or if you're feeling lucky, HOLDING) the A button while marbling around. In this marbly struggle across time and, yes, space, your main enemy is the timer at the top of the screen. Should this timer ever count down to 0, consider yourself all marbled out. No continues and no extra lives make this a game only those with a strong stomach should attempt. Although bonuses can randomly appear in the form of a magic wand (adds 10 seconds to game timer), don't count on them or think that any gameplay tactics will result in a reward. It's simple-just roll. If the magic wand appears once through all 6 courses, consider yourself lucky. If it appears more than once, take the next flight to Vegas; you won't get any luckier. Your time can be quickly eaten up by viscious attacks from acid, the (unbeatable?) evil black nemesis marble, and other beasts too horrible to be described (vacuums, etc). If you're playing the savage 2-player mode, don't make the mistake many new marble rollers do: thinking it's some sort of cooperative mode. Have no qualms about pushing your mortal enemy (red marble if you're 1p, blue marble if you're 2p) off a large cliff, into a pool of acid, or simply just leaving him for dead and finishing the stage first. Unleash a myriad of attacks on your marbled rival, including the brutal marble bash and the devastating SUPER marble bash. This cutthroat mode dangles juicy rewards in front of the player's faces: point and time bonuses for the marble rolling across that finish line first. This makes in-game decisions mind-numbingly difficult; do you take the tough, longer route for extra points now, or try to finish first and nab the extra time and points? These are questions only seasoned veterans of the marble world can answer. A word of warning: Let your opponent get too far ahead, and you'll be terrorized by a crippling 10-second time loss. Gameplay is divided into 6 devious stages. Although the first stage may be lauded as "practice", don't be fooled; there are already a wealth of options open to you. Should you play it safe, just taking the "safe" route straight to the goal? Or should you be a true rebel, flaunting all the rules and making a death-defying jump onto the special numbered pad for bonus points? It's all up to you in this epic marble adventure.